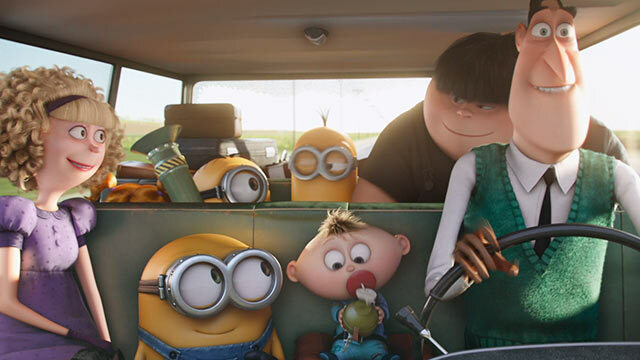 Last week we went to see Minions, a film I had been keenly anticipating as I loved Despicable Me 1 and 2, and had been thoroughly enjoying the Official trailers for Minions (1, 2, 3). It would be going way too far to say that I actually hated Minions, because I didn’t (it’s very difficult to actually hate Minions, because they are adorable ), but neither did I love it. There were so many moments when I could have loved it, indeed should have loved it, and yet, each time it failed me. Children, I gather, are enraptured by it, their parents not so much. Me? I was disappointed. Very disappointed. I read an interview with Pierre Coffin in which he talked about striking a balance between entertaining children and entertaining their parents, but I wonder now whose parents he was actually trying to entertain. For example, I thought it was telling that the day we went to see it, the only people who laughed at a lot of the musical references were Paul Kincaid and myself, the grandparent generation, possibly even great-grandparent generation, in an audience of fairly young parents who seemed not to have heard of the Monkees or to get many of the other musical references. For that matter, for those young parents, Queen Elizabeth II has always been an old woman, Spitting Image and the gin-swilling, gun-toting Queen Mum never happened, and the idea of a young Queen Elizabeth karate-chopping her way through an attempt to steal her crown wasn’t so much hilarious as utterly incomprehensible (as was the notion that she ended up as some sort of air hostess). And if I’m correct, and Scarlett and Herb Overkill are loosely (ok, very loosely) modelled on Sonny and Cher, for that audience, Sonny Bono is possibly the man who skied into a tree while Cher is … ok, perhaps they’d get the Cher reference, given her remarkable triumph over age and gravity, but I’m not sure. Richard Nixon? Who he? What struck me most forcefully about the film was the thinness of the narrative structure. It was bursting with great ideas, none of which Coffin and Co. really followed through on. The story was thin to the point of invisibility at times. I’d assumed that the Nelsons, the family that pick up the hitchhiking Minions on their way to Villain Con in Orlando, would play a much greater part in the story than they did (a dreadful waste of Alison Janney and Michael Keaton), particularly as the film got off to such a storming start with that wonderful robbery and chase sequence. Instead, the Nelsons pop up at intervals, more of a running gag than actual participants. I suppose it is impressive that the film-makers could throw away such riches on a running gag, especially when they also had an actual running gag – the fan-man dressed as Scarlett Overkill. I felt similarly about the arrival of the yetis at the Minions’ North Pole base – so much potential there for a comic schism of groups of Minions, each convinced they’d got the best new boss, and yet all of it thrown away casually on a weird Minions travelogue. Indeed, the more I think about it, the more I see the film as a series of set-pieces with little to link them. Much of the opening sequence was already familiar from the trailers (boy, did those trailers give away an awful lot) but despite having viewed them many times, they still had the capacity to make me laugh (sadly, the sequence with the upside down pyramid will never not be funny – a piece of me is a child). The car ride with the Nelsons was deliciously well-observed and the romp through the department store and Buckingham Palace were typically enjoyable Minion fare. On the other hand, London as seen by foreigners was tiresomely weird, as usual, and I cannot help feeling the campish newsreaders drinking tea between reading out sentences smacked of threadbare imagination, as though the film’s makers didn’t quite know how to express 1960s London (mini-skirts and bubble cars, gonks and unironic Union Jacks might have been nearer the mark, maybe, to match the tie-dye and long hair of the US). Slightly better was the portrayal of London after dark, all alleyways and Mary Poppins rooftops, with the sudden light and clamour of a bar, and a sense of something altogether more dangerous, though not eventually realised. In the end, however, we come to an ugly truth. Bluntly, the Minions are nothing without Gru. 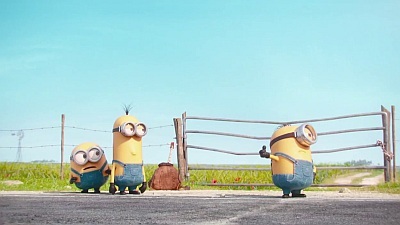 Before Gru, the Minions are cute but really not that exciting. The Minions have worked their way through history, looking for the perfect boss. They appear to be genetically wired to follow the biggest, baddest villain around at any given moment, and yet they fail constantly to keep hold of their boss. Why might that be? There’s a clue, perhaps, in the response of Mrs Nelson when the car stops and she opens the door, to look down on ‘these adorable little freaks’. While the Nelsons are obviously nowhere near bad enough for the Minions to be interested in them, the sequences with the Nelsons work because the Nelsons actually like the Minions, whereas there is little evidence that any of the other supervillains does. But clearly the Nelsons don’t possess the aura of power that attracts Minions, perhaps because they’re too self-sufficient. Similarly, Scarlett Overkill may like the idea of having minions, but the only person she really has eyes for is Herb (their relationship is, in its way, rather touching – Scarlett’s unhappy childhood is another plot strand vaguely waving but underdeveloped). Herb rather likes the Minions, not least because he has something similarly childlike about him – the sequence in the torture chamber is peculiarly funny, as they all play together – but he is not, in his heart of hearts, a villain, so that’s not going to work. When I saw the film, as it came to the moment when Scarlett Overkill was making one last bid to steal the crown and was suddenly frozen, along with Herb, a child’s voice rang out from the back of the cinema: ‘Gru!’ even before Young Gru actually appeared on the screen. One very attentive viewer had nailed it totally, and as if by magic the atmosphere in the cinema suddenly changed. Maybe it was because everyone knew they were now in familiar territory, but I wonder too if it’s not because while Gru may be a villain, he is as charming as his Minions, and more particularly he is charming to his Minions. He sees them as individuals and knows their names; not only is he the boss, he is a paterfamilias, though it takes him an entire movie to realise that he wants to be a father. And as we see in Despicable Me 2, the Minions continue to follow him even when he’s not being evil – they’ve spent their lives associating power with evil when, in this instance at least, the power lies in love. It’s always a little difficult to believe in Gru as a villain, perhaps because he never seems especially evil. He may have put morals aside during the course of his work but he seems more than anything afflicted with the sadness of duty rather than actively taking pleasure in what he does. Villainy is a challenge rather than a vocation.Or something. I’m grossly overreading Minions, of course, but it intrigues me that the last five minutes of the film, as the Minions stream down the road after Gru, are so much more exciting (with the possible exception of the early chase sequence) than anything else that’s happened so far. This entry was posted in non fiction and tagged despicable me, film, gru, minons on July 6, 2015 by maureenkspeller.